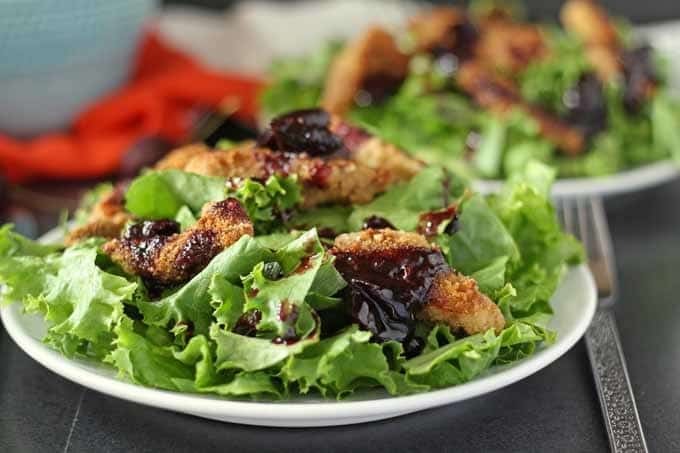 I am a brand ambassador for Maple Leaf Farms – they gave me these delicious duck tenders. Do you remember when I went to Duck University last month? Well, an added treat of my trip was a huge box of frozen duck goodies from Maple Leaf Farms. When Mr. B saw what was in the box, he was a happy man. I already knew what awesomeness was awaiting me and he was all too eager to taste all of the duck goodies. We quickly went through the duck bacon and duck wontons (you can get some of both online here). OMG. I was going to do something spectacular with the bacon but it was so good that we just ate it. We ate… It… All. But this recipe and post isn’t about duck bacon – it’s about duck tenders. Until I went on the facility tour at Maple Leaf Farms, I had no idea that the tender was made from a specific part of the duck (or chicken). For some reason, I thought it was breast meat that was just cut smaller. What an eye opener. Duck and cherries have long been paired together – a quick google search for duck + cherry will give you a slew of recipes. I am not going to tell you more than that because I want you to make my duck and cherry recipe. 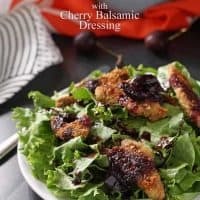 When I saw some delicious and super ripe cherries at the store, I knew that I had to make this duck tender salad with cherry balsamic dressing happen. 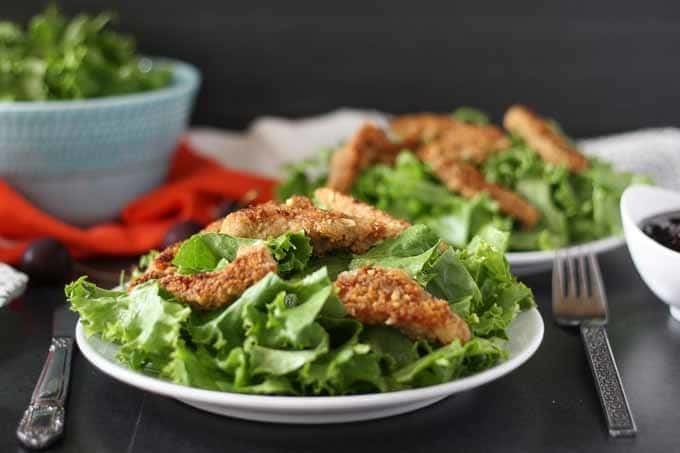 The salad is simple because the duck tenders are so delicious on their own. 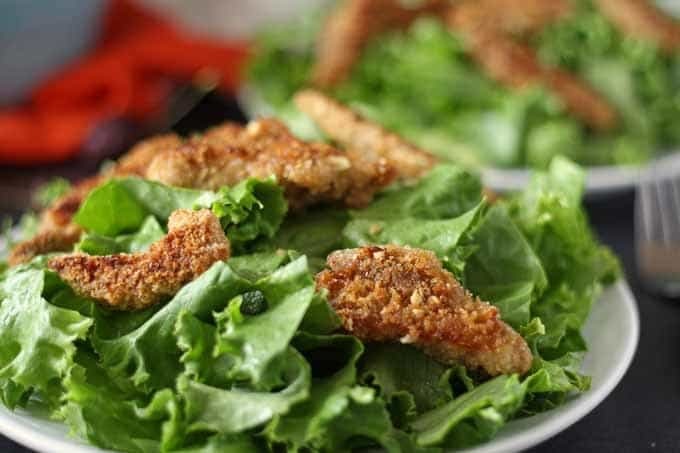 So much flavor in the little nuggets – they are breaded with crunchy bread crumbs and almond flakes. Heh, I wanted to eat them all up like I did the duck bacon but I used a little restraint. I made it with leafy green lettuce, but you could use romaine too. Just think crunchy when you’re buying your lettuce. Cook the duck tenders per the package cooking directions. In a medium saucepan, combine the cherries, balsamic vinegar, water, honey and vanilla extract. Bring to a boil. Reduce the heat and continue simmering. Stir frequently and occasionally smash the cherries with the back of a spoon. Cook until the mixture has thickened and the liquid has reduced by half. 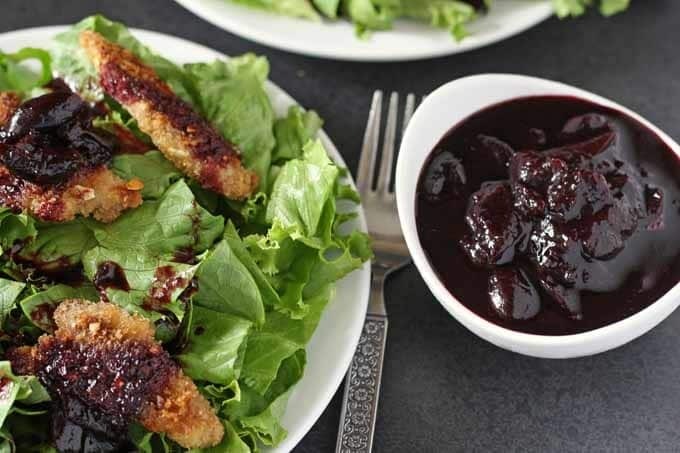 Prepare the salad - layer lettuce, then duck tenders and drizzle with the cherry balsamic dressing. If you’re looking for other duck recipes, check out my round-up of 16 recipes with duck. I’ve since come across some more duck recipes, mainly from the other bloggers who joined me at Duck University. 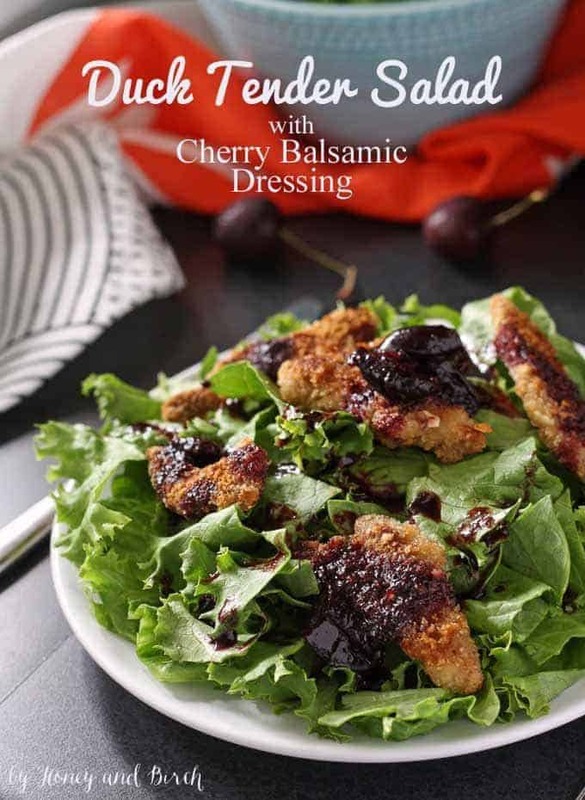 They are so good, I agree–love the dressing you used for the salad! Ohhh…this looks so good. Thank you for sharing the recipe. We have recently started raising chickens for meat and eggs. This really has inspired me to look into getting ducks for the same purpose. And Duck Bacon? Now that sounds delish! This sounds great but I would make mine with vegetarian mock meat. Thank you for posting! Shannon, I think it would still be good with mock meat! Hope you like it! Looked up duck tenders online and keep pulling up dog treats. I will keep looking.